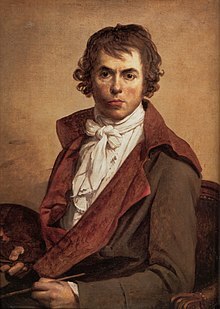 Jacques-Louis David (/ʒɑːkˈlwi ˈdɑːviːd/; French: [ʒak lwi david]; 30 August 1748 – 29 December 1825) wis an influential French penter in the Neoclessical style, considered tae be the preeminent penter o the era. In the 1780s his cerebral brand o history pentin merked a chynge in taste away frae Rococo frivolity toward a classical austerity an severity, hichtened feelin harmonisin wi the moral climate o the final years o the Ancien Régime. ↑ Matthew Collings. "Feelings". This Is Civilisation. Season 1. Episode 2. 2007.